Everyone has a different perspective of the type of person they want to marry but here are 5 things men look for in their life partner. Marriage is all about being together for a lifetime, in sickness and in health but it takes both the individuals to make it work. Although the divorce rate is high, nobody marries thinking that it won’t work. Caring person: To start with, they want a wife that understands them and learns to care about their families including in-laws. That is an important issue and getting along with the siblings and in-laws can be a win-win situation for the bride. Natural chemistry: You should have a good chemistry with your life partner, that comes along naturally. It shouldn’t be faked or forced. Either it is there or it isn’t. It has to be spontaneous and develops naturally. High self-confidence: Most men prefer confident girls that know who they are and what they want. But confidence isn’t cockiness. Just naturally smart and talented girls attract the right men. Important for men looking in there future life partner. Be yourself: You don’t have to pretend to be someone to attract the men. Men tend to prefer women that are honest and straightforward. They prefer those that aren’t trying too hard to gain the attention while appreciating those that are real. Look good: Women don’t have to be models but men prefer women who look good and have their own individual style of dressing. Whether she wears a cocktail dress or lounges in PJs, she needs to look attractive as men are more visual oriented. Assertive: Men don’t like needy types, but love it when girls know their mind and aren’t shy of saying it out loud. But there is a difference between being bossy and assertive, so ensure that you have maintained the fine line in between. 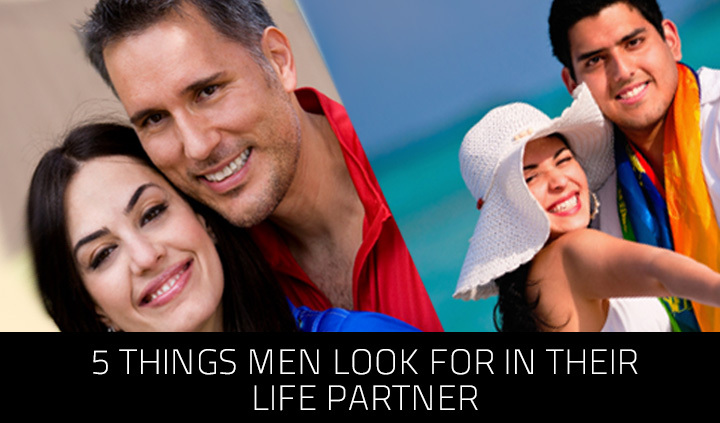 Now that you know the 5 things men look for in their life partner, you know what will work for you.